Apple is planning to reveal its new iPhone range on 12 September, but it appears to have been upstaged already. The 9To5Mac website has shown off leaked images of two new iPhone XS models and a new Apple Watch. 9To5Mac says “with certainty” that the two phones will be called both be called the iPhone XS. The Apple specialist publication also revealed a new Apple Watch, set to be the Series 4 – the big difference is the new Watch has an edge-to-edge screen with no bezel. However, rumors circulating on the internet have suggested that Apple will be revealing another new iPhone at its September event, as well as potentially several new Mac models including a new MacBook Air. So what do we actually know for certain about the new iPhone, and can we trust 9To5Mac’s leaks? 9To5Mac’s leak reveals two new iPhones. The image above is “not a mockup” according to the publication – it insists that they are the definitive, finished article. What Do the Leaks Reveal? The two iPhones share the iPhone XS name, despite one having a 5.8-inch screen and one having a 6.5-inch screen. Both phones will use an OLED screen, the same tech found in the iPhone X. In terms of both resolution detail and power efficiency, OLED is a step on from the LCD displays found in the iPhone 8 and 8 Plus. This should give the new iPhone XS models sharper screens, capable of displaying deeper blacks and brighter colours, despite the increase in overall screen size. Both XS models will be available in a previously-unseen gold colour, which should help them stand out from the now ubiquitous iPhone X. Is the iPhone XS an Improvement on the iPhone X? It’s difficult to say with certainty whether the two iPhone XS models revealed by 9To5Mac will represent a huge step forward from the iPhone X. They’ll be using the same OLED screen tech, and seem to follow in the same form factor, suggesting more of an evolutionary, rather than revolutionary, step. But, what if the two iPhone XS models aren’t replacing the iPhone X – but instead, are intended to replace the iPhone 8 and 8 Plus? If this is the case, then the XS models are, indeed, a step on. Ditching the LCD screen completely would be a big change for Apple, which has faithfully stuck by the screen tech, despite many of its competitors moving onto sharper OELD and AMOLED screens. On the other hand, the infamous notched screen, which debuted on 2017’s iPhone X, seems to be missing from both iPhone XS models in 9To5Mac’s images. If the notch were to disappear, (however unlikely this seems), it would potentially seem like an admission from Apple that other, smaller competitors had stolen a lead on it in the race for a bezel-less screen. Naturally, we’re still speculating at this stage and we won’t know the full details until the 12 September reveal. Tech.Co, of course, will be covering and analysing the big reveal as it happens. 9To5Mac also revealed a new Apple Watch. 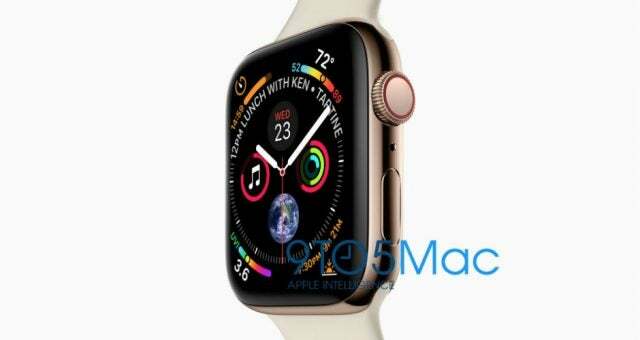 Again, details are scant, but we can ascertain from the leaked images that the Series 4 should feature a proper edge-to-edge screen, removing the hefty bezel which debuted on the first generation of Apple Watch. In practice, this means the Watch’s display would be around 15% larger than the Series 3, without any increase in case size. That’s a genuine achievement, given the hefty size of many Apple Watch competitors. This larger screen size would also accommodate new watch faces capable of displaying more information at-a-glance than previous Apple Watches. From 9To5Mac’s leaked images, we can see a total of eight complications littering the watch face including: a stopwatch, the temperature, calendar reminders, a UV reading, the sunset time, Apple’s trademark concentric activity goal completion wheels, the date and (presumably) the time elapsed on the song being listened to. There’s also a previously-unseen hole between the Digital Crown and side button, which is speculated to be another microphone. Is This a Step Forward from the Watch Series 3? If this image is, indeed, the final version of the Watch Series 4, then yes, it’s a pretty serious step forward. One of the major factors limiting smartwatch adoption has been the size of the devices themselves. However, this device would suggest that Apple is at the forefront of the smartwatch race, leaving other companies (particularly those using Google’s WearOS) with a lot of catching up to do. How does the Apple Watch Series 4 compare to the best wearables on sale now? Apple holds one major launch event in September every year. Typically, we see a brand new iPhone, sometimes a new iPad or Apple Watch and some updated MacBooks and iMacs. These are normally big, showy affairs with Apple CEO Tim Cook gracing the stage to tell us all about the company’s new products. So what can we expect from this year’s event? Will Apple Replace the iPhone X? It has long been rumoured, but these leaks seem to confirm that the iPhone X is being replaced by the XS. Unless, that is, the two XS models are actually due to replace the 8 and 8 Plus, though this feels less likely. Will There be an iPhone 9? This is difficult to say, but given that these two phones seem to carry on the style of the X, it looks like we’ll not be seeing Apple return to its old design principles. We’d imagine an iPhone XS Plus, or maybe an iPhone XI (or 11, depending on how grand Apple is feeling). Will There be a New Cheap iPhone? Cheap, of course, is a relative term when it comes to Apple. But our money would be on the smaller, 5.8-inch iPhone XS being the new ‘baby’ iPhone with prices starting around $750-800. Yikes. When Will the New iPhones be Available? There was a significant delay on the iPhone X coming to market after its mid-September reveal last year, but this was supposedly due to Apple’s supply chain being unable to meet demand. Hopefully, they’ve figured things out this time, and we’ll see the iPhone XS models hit the shelves a week or two after the event. However, it’s difficult to be certain. Rumours persist about a long overdue update to the MacBook Air, Mac Mini and even Mac Pro. However, we can’t be certain about these. Given that Apple “killed off” the iPad Air line (replacing it with a near-identical model simply called “the iPad”), it might be possible that the MacBook Air is dying a very slow and protracted death. We can’t image the Mac Mini and Mac Pro are long for this world, either. Given the recent launch of the iMac Pro, it seems that Apple wants to put a screen on all its computing devices, no matter the price tag. But we won’t know for certain until September 12, so check back in with Tech.Co then to find out everything from Apple’s big reveal. The post New iPhone XS and Apple Watch Leaked Ahead of 12 September Reveal appeared first on TechCo.